All over the world Christmas is known as a holiday that brings joy and is supposed to be spent with the family, whether some countries observe Christmas more than others it is still known as a global holiday. In America families usually celebrate Christmas by getting a Christmas tree, decorating their houses, giving gifts, and the kids writing letters to Santa but that may not be the case in other countries. 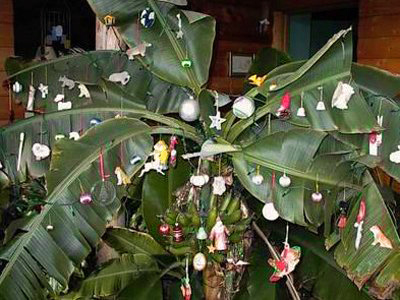 Here are some unusual Christmas traditions. Lets start in Japan while getting ready for Christmas Eve many families traditionally get KFC chicken for dinner like Americas have Turkey for Thanksgiving. This all started with advertising four decades ago by KFC in Japan and tradition has stuck since then. Staying in Japan Christmas cakes are also made to be eaten on Christmas Eve. Heading to the Philippines Christmas is a big holiday for them as most of the population is Christian so January 6 marks the end of Christmas because of the arrival of the three kings. So on January 6 children would leave freshly cleaned socks with specially designed shoes with candy and small gifts to give to the three kings passing through the night. India, who has the second biggest population in the world and 2.3% Christian, do not have pine trees at their expense so they use mango and banana trees instead. They decorate these trees with ornaments and lights and put them in their houses just like pine and fir trees. Moving over to Finland they remember those who passed away on Christmas Eve by visiting the resting places of those who have passed away and leaving candles. If you head over to Ukraine their Christmas trees are covered with artificial spider webs because they believe that seeing a spider web brings good luck. In what is probably the weirdest in 1966 in Galve, Sweden they have a huge goat figure made out of straw and when the clock hit 12 on Christmas Eve they would burn the goat statue. Although every time the goat statue gets burned and destroyed they rebuild it and have done so about 25 times since. Christmas is universally known holiday but it can be celebrate in a lot more ways than people know.